Bend is the focal point in central Oregon for active lifestyles and outdoor adventures, with sun all over, snow fun at Mt. Bachelor and recreation for all ages and athletic abilities. Nestled at the base of the picturesque Cascade Mountains, the resort communities of Bend, Redmond, Sisters and Sunriver, Oregon offer a spectacular year-round setting for outdoor recreation. Each has a lot to offer an active family yet Bend, with its offbeat small town charm, is the most fun base for those with older kids. Mt. 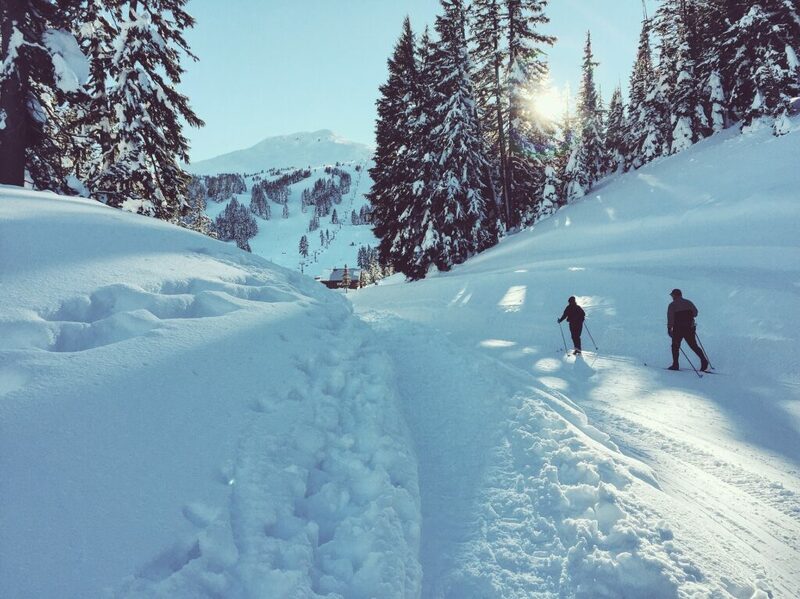 Bachelor’s famous light powder makes alpine and cross-country skiing a pleasure. Following in the footsteps of Tahoe City (the 1980s) and Salt Lake City (the 1990s) as a home to active recreation professionals, Bend’s residents give off a high energy vibe whether they’re strolling, biking, enjoying streetside cafes or perusing the outdoor gear shops. It’s contagious and should inspire your family to try golf or tennis, mountain biking, whitewater rafting and hiking and, in winter, skiing, snowboarding or ice kiting sports. Sunshine and blue skies provide the backdrop for magical snow-covered landscapes, especially at Mt. Bachelor, a volcanic cone located about 20 miles west of downtown with no slopeside lodging, fancy base village or condo developments. Instead, the resort famous for an annual 462 inches of light, deep, dry powder plays host to Olympic hopefuls and international competitions, as well as families looking for winter fun. With 71 runs already served by a network of 10 of the world’s fastest express lifts, they opened Cloudchaser in 2016 to serve 635 acres of new terrain and 14 new runs across the mountain’s weather-protected east side. In addition to alpine sports, snowshoeing tours, sled dog rides and Nordic skiing are all offered on site. As the tallest mountain in the Cascades with a lift-served summit of 9,068 feet, the snow riding season typically lasts from Thanksgiving through Memorial Day weekend. Central Oregon’s beautiful scenery, sunny skies and dry climate have helped create the ideal setting for golf. Many of the game’s finest architects – most recently including Jack Nicklaus, Tom Fazio, and Bandon Dunes designers David McLay Kidd and Tom Doak – have taken that setting and made it a mecca for golf enthusiasts from spring through late fall. The Central Oregon Golf Trail boasts 30 super scenic courses – many on the foothills of Mt. Bachelor, many with a championship rating and each unique. At Sunriver Resort, a prime destination resort and convention destination for active Northwest families, professionals and amateur golfers thrill to the challenge of Crosswater, a Golf Magazine Gold Medal award winner. The Pacific Amateur Golf Classic, held each October on a selection of Central Oregon’s most scenic and challenging courses, has earned the reputation as one of the premier amateur golf events in the country. Golf and skiing are only a part of the story however. With nearly 300 days of sunshine, outdoor recreation of all kinds beckons visitors throughout the year. The High Desert’s sparkling rivers and dozens of alpine lakes offer some of the finest fishing in the West. Rafting, hiking, boating, and biking are popular pastimes of tourists and locals alike. The knowledgeable guides at Wanderlust Tours offer unforgetable canoe, cave, and volcano tours in the summer as well as beautiful moonlight snowshoe tours in the winter. When it’s time to come indoors, the High Desert Museum just south of Bend offers a fun, educational experience for the whole family. The nationally acclaimed “living” museum explores the natural forces, historical events and cultural traditions that have shaped the region. This showplace facility incorporates live animals, a dynamic Birds of Prey exhibit, pioneer presentations, Western and Native American art, streamside exhibits, walk-through-time dioramas and more. At the museum’s Spirit of the West exhibit, visitors can experience life as it really was in the region by exploring a re-created 1880’s mine and settlement town with a real Wells Fargo & Co. Express and Chinese mercantile shop. At the Blair’s family cabin, visitors are taught how to churn butter, split wood and dip candles; all techniques necessary to the pioneers who once occupied the high desert. After getting face to face with real live animals in the museum’s forested atriums and Birds of Prey exhibit, kids can play like wild animals at an indoor play place that features a pretend eagle’s perch, a pack rat nest and, for the youngest visitors, a puppet stage. The museum also houses a number of more traditional exhibits. By Hands Through Memory focuses on the Plateau Native Americans who bravely weathered Reservation-era America to retain their tribes’ identity. The Brooks and Collins Galleries are devoted to regional artwork and culture. Once your family has done everything there is to do inside, be sure to explore the 135 acres of forested educational trails that surround the High Desert Museum. Many visitors spend a half day hiking through the unusual terrain and sign-posted trails. Summer visitors should be sure to allow a day to make the 180-mile roundtrip excursion to Crater Lake National Park, one of nature’s wonders. (In winter, when the North Entrance is closed, visitors must use the South Entrance, 145 miles away, making it too long for a daytrip.) Crater Lake is so distinctive because its deep blue pool of snow melt is surrounded by the 2,000-foot-tall jagged rock walls of a volcanic crater, making it one of the deepest lakes in the world. The unusual geology makes it a popular laboratory for environmental researchers and scientists, and the National Park Service organizes many learning programs for 4th and 5th graders. With an average of more than 44 feet of snowfall per year, visitors are likely to see the surrounding peaks capped in snow year round. The park, about 250-square-miles, has wonderfully scenic driving paths but becuase of the snow, you can only count on them all being open in July and August. However winter is a fantastic time of year to try snowshoeing and other snowsports on land that is closed to vehicles. Camp sites are available all year but proper gear, and coordination with park rangers, is a must. Accommodations in central Oregon cater to every budget and taste from intimate bed and breakfasts to luxurious Four-Diamond resorts to traditional Western dude ranches. If you’re only here for a day or two, we suggest soaking up the village atmosphere of downtown Bend. A busy cultural calendar includes live music, theater, art and music festivals as well as many special events. Bend’s Old Mill District (mall and multiplex in a converted timber mill) is a hub of shopping and fine dining. It’s fun to join the locals for an evening at the Deschutes Brewing Company< or Bend Brewery, two local family-friendly pubs where the food is very good. For a fresh interpretations of the region’s salmon and sturgeon catch in a pretty, riverfront setting, try Anthony’s Seafood. The rustic but charming Ameritel Inn is conveniently located in the Old Mill district — a location that is advantageous for both shoppers and nature lovers. The Inn features a swimming pool, complimentary breakfast and high-speed internet. To make reservations, visit the Ameritel Inn online or call 541/617-6111. Within an hour’s drive of Bend, more good restaurants and artisan shops abound in picturesque settings. There’s the rustic Old West feel of small, affluent towns like Sisters or the purpose-built village of Sunriver. For beauty and sophistication in a resort setting replete with golf, watersports, swimming pools, elegant condos and private homes — in fact anything a family might need for their Bend vacation — consider renting a unit at Sunriver. Convenient commercial air service to Redmond Municipal Airport (RDM) from Los Angeles, CA; San Francisco, CA; Portland, OR; Seattle, WA; Las Vegas, NV; Salt Lake City, UT; Phoenix/Mesa, AZ; and Denver, CO, make this paradise accessible. For more information about sightseeing, fun family attractions, and lodging discounts, contact Central Oregon Visitors Association at 541/389-8799. Next Article Next Article What’s Red and Black and White All Over? A Caviar Lobster Roll!